It’s every commuter’s dream – you’re stuck in an epic traffic jam and with the press of a button, your car does the driving for you. 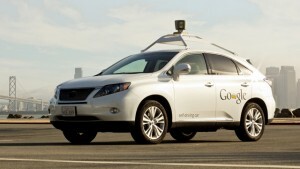 Now, thanks to companies like Google, robotic car technology isn’t far off. This week, the state legislature is considering a bill that would set up rules for putting self-driving cars on the road. The technology has evolved rapidly. Just five years ago, I was in an empty parking lot in Mountain View, taking a ride in what was once an extremely rare vehicle. “We’re seeing a 3-D rendering of Junior’s understanding of the world. So you see the car, but around the car you see the sensor data,” said Mike Montemerlo, pointing to a laptop screen. At the time, he was an engineer at Stanford University working on Junior, the robotic car. I was tagging along on one of Junior’s test drives. “We’ve parked this Tuareg in the way here so he has to maneuver around it to fit into his parking spot,” he said. Using lasers mounted on all sides of the car, Junior avoided the other car and swung into a parking place, its steering wheel turning back and forth independently. Junior had a lot in common with a teenage driver. “He’s still not very smooth, but we hope he’s reasonably safe,” said Montemerlo at the time. What a difference five years can make. “We just announced that we’ve driven over 300,000 miles without incident while the cars in are autonomous mode,” says Leslie Miller, public policy manager at Google. The company has driven away with robotic car technology, so to speak. Google has a dozen of these cars and for the past few years, they’ve been testing and tweaking them. “The vehicles have been on highways, in congested urban streets. We’ve been down curvy roads including over the Santa Cruz Mountains,” she says. Someone’s been in the driver’s seat for all those test drives, just in case. But the cars are in sort of a legal gray area. “No state in the country built rules of the road with the idea that autos would be able to operate without a driver behind the wheel. So we want to help establish these parameters,” says Miller. That’s why Google is sponsoring a bill in the California Legislature that would allow self-driving cars on the road. It also instructs the DMV to set up safety standards for the cars. That includes things like: if the car’s computer crashes, it comes to a complete stop. 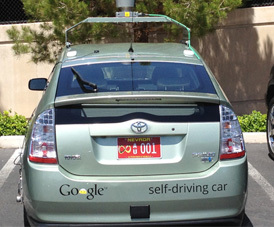 Nevada and Florida have already passed similar bills and earlier this year, Nevada was the first state to officially license Google’s self-driving Priuses. The cars were given special red license plates. Miller says they’re hoping to see the legislation spread nationwide. “For Google, the interest is reducing the number of accidents and fatalities that are caused by human error on the road. The technology is not going to be distracted by grabbing the phone or eating lunch or putting mascara on,” says Miller. Google hasn’t said what its business plan is for the technology, but many in the industry expect fully self-driving cars to be available in showrooms as early as 2025. That raises a host of legal issues. “In California, the biggest issue right now has to do with liability,” says Daniel Gage, spokesman for the Alliance of Automobile Manufacturers. “Eventually there will be incidents and there will be litigation,” says Bryant Walker Smith, fellow at Stanford Law School. Privacy groups, he says, are concerned about the personal data these cars might record, since they clearly know where you are. Then there’s the question of how tough safety standards should be. “Should these vehicles be expected to drive perfectly without any collisions ever? Should they be expected to perform as well as a perfect human driver or an average human driver or better than an impaired human driver?” says Smith. Even trickier are cases where we make moral decisions as drivers. “Say if a vehicle has to choose between hitting a child in the street or swerving and going off of a cliff. That’s a decision that someone would make in the spur of the moment. Do they save their life or somebody else’s? What decision would a vehicle make and who would be responsible for making that decision? If these seem like heavy issues for a state agency to figure out, Smith says there will be a transition to self-driving automobiles. Automakers have already rolled out technology that warns drivers about their blind spot and helps them avoid accidents. Despite the questions that remain, the impact, says Smith, will be huge. “Our existing world is one in which 30,000 people die in the United States on the road every year. Drivers who are impaired or unqualified are behind the wheel. I would ask is the status quo acceptable?” he says. If the California Legislature passes the self-driving cars bill, the Governor has until September 30th to sign it. Lauren is a radio reporter covering environment, water, and energy for KQED Science. As part of her day job, she has scaled Sierra Nevada peaks, run from charging elephant seals, and desperately tried to get her sea legs - all in pursuit of good radio. Her work has appeared on Marketplace, Living on Earth, Science Friday and NPR's Morning Edition and All Things Considered. You can find her on Twitter at @lesommer.